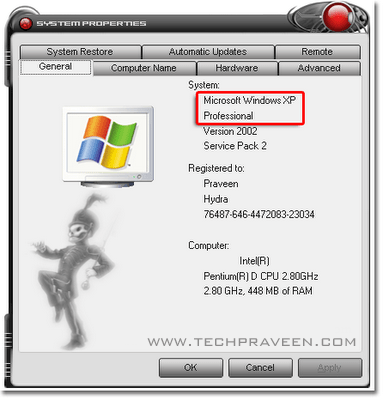 How to check whether windows XP installed on your Pc is a 32 or 64 Bit(x86 or x64)? You are here: Home / Xp Tips and Tricks / How to check whether windows XP installed on your Pc is a 32 or 64 Bit(x86 or x64)? Do you want to know whether your Windows Xp is a 32-bit or 64-bit operating system? 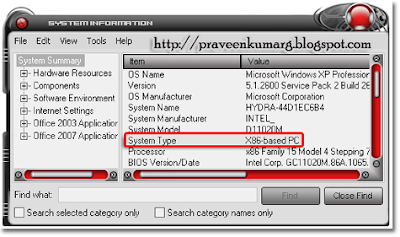 Microsoft usually labels them as x86 and x64 respectively.Many may have doubt during Windows 7 installation process,it will ask for x86 or x64.Here are 2 simple methods to check whether windows XP installed on your system is a 32-bit or 64-bit operating system(x86 or x64). Microsoft Windows XP Professional x64 Edition Version appears under System. Type msinfo32.exe and hit press Enter. For 32-bit editions of Windows XP, the value of the System Type item is x86-based PC. For 64-bit editions of Windows XP, the value of the System Type item is x64-based PC. Thats such a simple trick . My friend was looking for this only . Thank you so much.